Beautifully engraved certificate from Organic, Inc. issued in 2001. This historic document was printed by the Security-Columbian United States Banknote Company and has an ornate border around it with a vignette of the company's logo. This item has the printed signatures of the Company’s President, and Secretary, and is over 10 years old. Originally known as Organic Online before changing its name to Organic Inc., the company was founded as the first marketing & advertising agency focused solely on the Internet. They created the internet's first banner ads, which ran on HotWired. 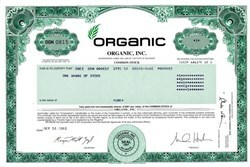 Organic completed an initial public offering in February 2000, but like many dot-com companies, Organic was adversely affected when the Dot-com bubble burst and drastically reduced its size. It was re-privatized in 2001, and in 2003, became a wholly owned subsidiary of advertising holding company Omnicom Group.